Our robot for the 2017 FRC Season, named for its vibrant LED ring, which sits atop a tower-like structure. It is capable of catching a rope with a knot on the end in its climbing mechanism and, obviously, climbing up it. It is also capable of obtaining and delivering gears, as well as shooting and intaking fuel cells with 70% accuracy. A steampunk themed game that requires alliances of three robots each to compete against each other to try and score fuel cells (large-ish, neon yellow whiffle balls) into the boiler in order to fuel an 'airship.' Human players (pilots) in the airship collect gears from the robots below in order to prepare the ship for flight and when the match is 30 seconds to complete, human players drop a rope for the robots to climb aboard the airship. A training project for our new fall 2016 students, it offered students from every subteam a chance to learn their trades better and to understand how the robot fits together as a whole. 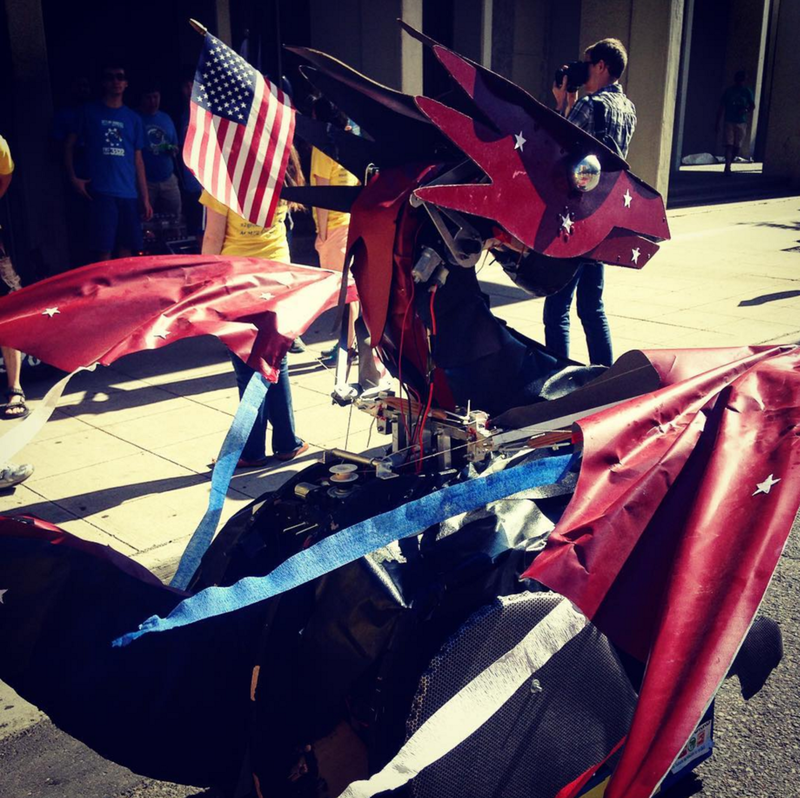 Dragonbot at the 2016 4th of July Parade. Dragonbot at the 2015 BooBash. Dragonbot at the 2015 Detroit Maker Faire. Dragonbot at the 2014 St. Jude's Walk. Dragonbot is a long term project which has been worked on by the RatPack since 2013. Made from a frame so kindly loaned to us by FRC Team 3322 - Eagle Imperium, he has slowly become the heart and soul of our team. He's gone through many color changes and repairs but he's still going strong. Capable of opening his jaws, spreading his mighty wings to take flight, roaring (or, alternatively bleating like a goat), and breathing smoke; he is an unfaltering showstopper, and we bring him with us on most of our promotional visits to display what our team has to offer as well as to promote and advertise the FIRST community. Dragonbot is a beloved staple of this team, and is not expected to be leaving the show anytime soon.